One great way to get to Achill Island is by cycling from Westport to Achill Island. The 42km long bike path and footpath makes this journey safe and with a few hills accessible to everyone. The stretch of 42 km can be completed in one go or in stages with scenic breaks along the way! The path is interesting and the cyclist goes over various bridges and the scenery changes along the route. This scenic route to Achill is perfect for seeing wildlife and flora along the way. The last stretch from Mulranny to Achill is the most rewarding with soft peaks appearing on the horizon and the unique clouds of Achill that fill the skyline. A good place for a pit stop would be the Mulranny Park Hotel where they serve excellent fish dishes, the chowder being everyone’s favourite! Pick up a Gourmet Greenway Map when you are there for insights on places to eat on the route. 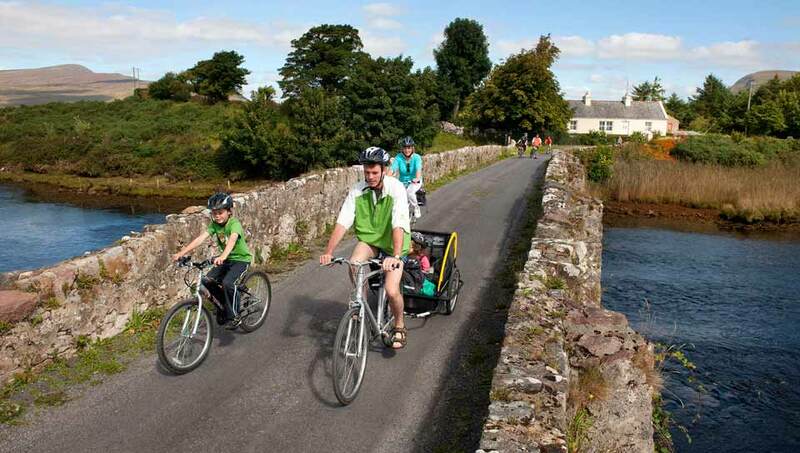 A great way to do this is to rent your bike from a company like Clew Bay Bike Hire. This is especially useful if you are new to cycling and need your bike repaired along the way (they will come and fix it or swap it for another) and if you decide to spend the rest of your holiday in Achill they will bring your bike back to Westport. This is one route well worth trying once to experience the ease of using the greenway and enjoying the beauty of the landscape! One for the bucket list in Ireland we say at Rent An Irish Cottage!!!! Stay in near by Killorglin on the Ring of Kerry and try the amazing Slea Head Loop of the Dingle Peninsula. This amazing cycling journey takes the cyclist around the peninsula. What makes this cycling trip so exciting is the changing beauty of what you see, the landscapes of sea and rock faces are constantly different and there are plenty of different sea birds on the way and the odd sheep on the road. There are no hills on this cycling stretch but gentle inclines and windy roads keep in interesting. A good place to stop for a break on the half way mark is Tig Áine for homemade scones and a pot of tea. This tea room is seasonal opening on May 1st. The Slea Head cycle has less traffic on it during the winter months and as you would imagine there are more touring cars and busses on it during the summer months. Web Apps to Help Cycle Your Way into Fun this Summer! Mapmyride.com – this free app monitors your speed, elevation and climb or you can use the website to find routes that other cyclists have used in the area.